I don’t know how the blog, Authors Electric UK, is working for other people, but, as one of its members, I find it’s certainly widening my own reading. With so many writers joining us, natural curiosity leads to me downloading at least a sample of their books, and often the books are so cheap - cheaper than a magazine – that I think, why mess about? I’ll just buy it. And often I read the books thinking, this is so good, why haven’t I read these author before? Why have they been abandoned by publishers and pushed into self-publishing? This is exactly what I thought when I downloaded these three short stories by Catherine Czerkawska. They are exquisite – like ‘The Butterfly Bowl’ of the second story. It’s a plain little Chinese bowl, handed down from Debbie’s great-great-grandfather. It’s nothing special to look at but, when filled with water, the bowl seems suddenly filled with butterflies. Showier articles from Great-Great-Grandad’s collection had been lost or sold, but this modest little bowl had been treasured for its secret. I won’t tell you any more. The author says that the stories are about love – and they are, but not in the usual way. ‘The Butterfly Bowl’ deepens and widens the more you think about it. It’s about love, about cost and value, about the deceptiveness of appearance, about memory and family. It’s about the need to keep the central, hidden core of yourself free, about the way love threatens that freedom, about talent and creativity. All held in the image of a little white bowl. I've read long novels that didn't hold as much as that little bowl. Hell, I've written long novels that don't hold as much. 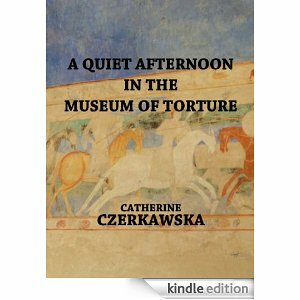 The title story is about torture, but not the kind of torture to which the museum is dedicated. The central characters are a couple with a newborn baby: and suddenly their world is full of terror and threat. ‘I didn’t know it would hurt this much,’ says the mother, and she isn’t talking about the birth. Three stories about love – but not the happy-ever-after, romantic idea of love. These stories are for adults: they're about love in the real world – plain, perhaps, as a white china bowl: painful as thumb-screws. Love the description of the butterfly story! I do find myself tempted by a kindle to explore all these suddenly revealed books & collections but am not yet sure enough - especially with the collision of formats including library loans. The idea of reading on-pc-screen doesn't appeal much. Thanks for recommending this, Sue. I'd never heard of the author before but will look out for her now, as I loved these stories. A wonderful review, Susan - Catherine Czerkawska is a hugely talented author (and a friend, to declare an interest!) and it truly is bewildering that so many terrific authors are abandoned by publishers. I've read amazing books and stories that I'd otherwise have missed out on - and it's more than worth the effort of picking them out from the undeniable amounts of dross. I do think e-publishing is proving a positive thing in so many ways. Thank-you so much for this, Susan - and how lovely when somebody really understands what you were trying to say! So glad you enjoyed them.